Click on each of the links in the text below to view the high-resolution NASA images which Bob is referring to in his presentation. Alternatively, click on each of the thumbnails in the collage for large high-resolution images that can be downloaded and examined closely. Bob Dean (BD): I hope I can be heard. Will someone turn this on? Before I begin, I would like to say a couple of words of deep appreciation for the sponsors and people who have put this program together. I have been involved in speaking publicly all over the planet and all over the United States. I have been to conferences here, I have been to conferences there, and I know how terribly difficult it can be to put a program like this together. I have to say I have tremendous respect and admiration for the people who have done this. Most of all, I respect their courage for dealing with a subject like this where most of the elite leadership and the power groups of the world want this subject to go away. And these courageous young men who have put this together are brave and they deserve your respect and your admiration, and I want to say I thank you because I know what you’ve been through. Now, I must explain something else to you. I never read from a script. I don’t have a prepared script to follow. I get up on a stage and I talk to people like yourselves and I kind of wing it. I have so much material and I have such a problem of keeping it under the allotted time that I’ve been given. I have come today prepared to speak to you for three hours. I am only allowed one hour and fifteen minutes. So something is going to have to give. But bear with me, I’ll do the damndest job I can. It’s important that you see the photographs of the NASA pictures that I have brought with me. Now, my journey began 45 years ago. I began a journey that, if I had known then what I know now, if I had known the pain, the anguish, the heartbreak that I was going to experience over these 45 years, I might not have started that journey at all. But here I am in Barcelona in 2009 with some of the most delightful people I have ever met. And looking back, I find that the journey was worth the effort; it was worth the pain; it was worth the heartbreak. I’m delighted to be here and I’m delighted to see all of you out there. This is such an encouragement to me that people are beginning to demand the truth. They know they have been lied to from the very beginning, and they want to know. And I’m going to -- here, this afternoon, hopefully -- contribute one small measure to helping you understand and helping you know. Most of my adult life, or most of the first part of my adult life, I was a professional soldier. I was in the army. I joined the army in 1950 to avoid the draft, ended up going to Officer’s Candidate School (OCS); and, so help me God, while I was going to OCS at Fort Riley, Kansas, the North Koreans invaded South Korea. The next thing I know I’m on the front lines in Korea being shot at by a bunch of pissed-off Chinese and North Koreans who tried to kill me -- and I had nothing against them; I didn’t want to kill them. Here I am, in 1951, leading combat troops in Korea in one of the bloodiest wars we have ever had, and the rest, I guess you could say, is history. I led combat troops in Korea in 1951; I spent 27 years on active duty and I also was involved in the war of Southeast Asia in 1970, where I was part of an organization that gathered intelligence in the jungles of Southeast Asia: South Vietnam, Laos and Cambodia. Let me tell, you some of those years were rather harrowing. The most harrowing experience I was to have was when I was assigned to Paris, France, in 1963, to what we considered in those days a plush assignment, a plumb assignment. I was able to go to Paris, France, take my family with me and my children went to high school in Paris and, as I said, this was a plumb assignment. I had no idea what I was to find when I got there. When I arrived in the summer of 1963, I arrived with a Top Secret clearance. When I arrived at the Supreme Headquarters Allied Powers in Europe, which was located at that time in a small town known as Rocquencourt, right outside of Paris, my security clearance was upgraded to Cosmic Top Secret, which was then -- and still is today -- the highest level of security classification that NATO has. I had to have a Cosmic Top Secret clearance to work in SHOC, Supreme Headquarters Operations Center: the war room. I was a Senior Master Sergeant at the time and, when I was assigned in SHOC, I was given the job of maintaining the Duty Roster. We worked on a 24-hour basis, day after day after day. And I was given the job of running the Duty Roster when I worked in SHOC. Back in those days -- let me tell you, the war rooms were somewhat primitive. You’ve seen pictures today; I’m sure, of the control centers of the most major installations like S.A.C. [Strategic Air Command] in Colorado Springs. Everything is electronic. Everything is demonstrated on the wall extensions just like this mural that’s up here. Back in those days we had teletype; we had field telephones and, if we wanted something on display, we had to go up and take a pin and put it on a wall and show the controllers where this division was, where that Soviet regiment was and so on and so on; very primitive. When I arrived in the summer in 1963, I heard rumors about a study that was underway. 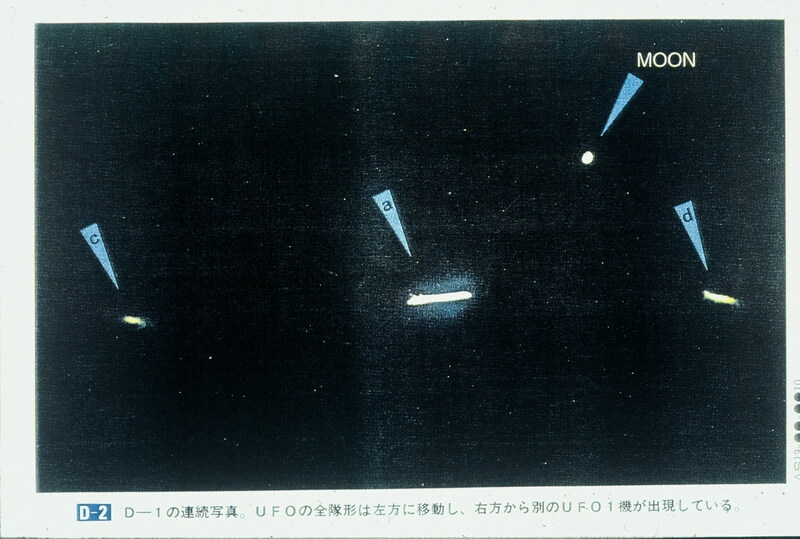 Now, it interested me instantly, because the study was about UFOs and I was intrigued by that possibility. I was curious about UFOs and had no idea then what they represented. But we used to discuss this in SHOC, in the war room, that something was underway. What was it about? What happened? Well, it appears that on the morning of the 2nd of February 1961, World War III almost began. It was involved in the flyover of large numbers of circular metallic craft, flying in formation, very obviously under intelligent control. They would fly out of the Soviet sector in the Warsaw Pact toward the U.S. in formation at a high rate of speed and at a very high altitude. They would turn north over the English Channel over the southern coast of England and then they would disappear off of NATO radar over the Norwegian Sea. On that morning of the 2nd February 1961, World War III almost began. The Soviets went on red alert. The NATO forces went on red alert. Everybody was, you know … fingers on their triggers, thumbs poised above those red buttons. And World War III was just moments away. Within 20 minutes, it was all over. The objects flew, turned north and disappeared off of radar. It was all over. After this event occurred, a British Air Marshal, by the name of Sir Thomas Pike, who was a Deputy Supreme Allied Commander in Europe at that time; he was the deputy to my boss, General Lyman Lemnitzer, an American Four-Star General who was known as SACEUR, Supreme Allied Commander of Europe. Air Marshal Pike says: I’ve had enough of this. These objects had been showing up regularly, from time to time. As I said, they almost triggered a war.Air Marshal Pike said: We are going to come to terms and find out what the hell is going on here. I want to know. So he began a study. He initiated a study in SHAPE [Supreme Headquarters Allied Powers Europe] headquarters that was to last for three years. They published it and issued it in the summer of 1964 while I was there working in the war room. They titled it An Assessment: An Evaluation of a Possible Military Threat to Allied Forces in Europe. That’s all it had. Just a title head and front, couldn’t learn very much about that: An Assessment: An Evaluation of a Possible Military Threat to Allied Forces in Europe. I was working in the war room one early morning around 2:00 or 3:00 a.m. and, as I jokingly used to refer to it, the coffee was too black to drink. We read all the newspapers and magazines. Many of you have heard military life is about 99 percent boredom broken up with one percent of sheer terror. And that’s the way it used to be and that’s the way it probably is even today. I’m sitting there nodding off, and this American Air Force Full Colonel looked at me and he says: Wake up. He went over to the vault. The vault at SHOC was a walk-in safe. You opened the door and walked in and we kept classified documents in there. The colonel went over to the vault, the file, and pulled out this document and threw it on my desk and he says: Read that; that’ll wake you up. Ladies and gentlemen, my life changed. I opened the first page and I couldn’t put it down. I read and read and read. And I read it every time I was on duty in the war room. I was shocked; I was stunned by the implications of what I read in that study. As I said, my life has never been ever quite the same. The study, briefly -- and I have to briefly lay this out; I could talk for two hours about this -- but the study simply concluded this: Is there a threat to Allied Forces in Europe? Apparently not. They concluded that the planet Earth and the human race had been under some kind of survey or observation going on for hundreds, if not thousands, of years. They concluded, in 1964, that there were at least four different groups coming here, observing us, surveying us, analyzing us, closely watching us, what we were up to, what we were doing. They concluded that it did not appear to be a military threat involved, because their repeated demonstrations of incredibly advanced technology demonstrated to us that, if they had been hostile or malevolent, there was absolutely nothing we could do. If they were evil in their intent and they were hostile toward us, it would have been over a long time ago. So, the conclusion was there were four different groups involved. They have been coming here for a very, very long time. Apparently they were not malevolent or hostile. The question was: What the hell are they doing here? Why are they here and why are they interested in us? Well, we did not know in 1964 what their agenda or their motives were and I will tell you, honestly and frankly, that even today our authorities, our senior military, our national security people still don’t totally grasp what their motives are, what their agendas are. Well, this study in 1964 was simply a beginning for me. As I said, I was never really quite the same again. I jokingly say I’m usually a normal human being. And, after I read that study and launched on my 45 years of research, I lost all aspects of normality. I will be frank and tell you that over the years of my study, and the material that I have learned and gathered has brought about in me a complete destruction of my old world view, my old world paradigms. The world view that I held since I was a kid growing up -- everything made sense, you know. I knew why I was here and I knew where I was going, what was taking place. After I spent 45 years on this, it all collapsed around my knees. That was the destructive aspect of my personality. That was the part that changed me completely from the kind of human being that I had been before into the kind of human being I am today. Ladies and gentlemen, I am totally alienated. [laughter] No pun intended. I said in a couple of interviews and previews and such: I have had -- for many, many years -- a love-hate relationship with the human race. One moment I love you. The next minute I hate your guts. One minute I adore you for the potential and the beauty of your music and your literature and your art and the next minute I’m saying: To hell with all of you. Blow them up. Let them blow themselves up. Clean the planet off. Get rid of them. That’s part of the struggle of having lost your old worldview when your whole paradigm collapses around your knees. So the man standing in front of you here today is literally a human wreck, as compared to what I used to be. But I feel pretty good about it. I lost all my old illusions. I opened my eyes and I saw the future. And I’m very happy about what I see. I have learned over the years from an infinite variety of sources here, there and everywhere. I didn’t retire from the army until 1976 and I kept my Top Secret clearance up until that moment. After I retired, I went to work for the Federal Emergency Management Agency and worked another 14 years for the U.S. government, where I had a Top Secret clearance. So I have a total of 41 years of federal service to the United States. But I’ve heard things over the years that literally still today stun me and shock me. I’ve learned that the human race is a hybrid race. I’ve learned that we are not merely alone; we have never been alone. We have had an intimate interrelationship with advanced extraterrestrial intelligence from the beginning of our history. And let me tell you that that intimate interrelationship is still going on. This one race, in particular, apparently reengineered us as a species about 200,000 years ago. What we are here today is what we call homo sapien sapiens -- you’re an engineered creature. Your genetics have been manipulated. You’re not the same as what you were and you are not the same as to what your children and grandchildren and great grandchildren will be in the next hundred years. The human race is going through a transition. It’s more than a transition. It’s what I have learned to be a transcendent transformation into a new race, into a new future. And your descendants will be as different from what you are here today as what you are from the old Australopithecus happened to be many years ago. That’s not something to be afraid of. It’s something to look forward to. You’re growing, you’re developing and you’re becoming a new race, a new species. Your grandchildren, your great-grandchildren and the descendents on in the next century or two have destiny in the stars. Don’t you doubt that for a minute. This species, this race, this troublesome bunch of monkeys, has a destiny in the stars and we are a part of this infinite universe filled with intelligent life. And we have been from the beginning but we are only now beginning to wake up and see it. Only now are we beginning to open our eyes and listen with our ears and look out there and say, all right where have I been? What am I now? Where am I going? As I said, your destiny is in the stars. Your generations to come, your descendants, your grandchildren and your great-grandchildren will go out there and they will claim their rightful place. [applause] In a universe filled with intelligent life. Your place out there belongs to you. You have a right to that and you will claim it. There is so much to talk about. I’ve got some slides that I have to share with you. Would you gentlemen please put the first picture up on the screen? I’m being assisted by some very wonderful people back behind the scenes. I like to start with a shot like this. Pictures of this nature inspire me. It gives you a glimpse of the community you are a part of, a little glimpse of the stars out there, the nebulae. That’s where you’re from and that’s where you’re going home again to. That’s where you belong. Next picture, please. I love these; they’re so beautiful. I have some of these on my wall at home. They inspire me. I look at them and I have the sense of recognition that I’ve been there before and I know that I’m going back. But something happened in my country over the last few years that I am very, very troubled by. Just last week the United States celebrated the 40th anniversary of putting a man on the moon. They went through this whole whoop-dee-do of patting ourselves on the back. Gee, wasn’t that neat. Armstrong, Aldrin, you know, Collins up there in orbit, on the moon. Aren’t we great people, aren’t we magnificent? Look what we did. Well let me tell you about a couple of things they did that you may not have ever have heard about before. They took the few pictures they had; they had it all televised. Everybody -- Rock, Walter Cronkite and all of them were looking up. Golly, gee, isn’t this great, isn’t this neat? We’ve got a couple of guys on the moon. Ladies and gentlemen, my government, NASA, which many of us in the United States say stands for Never A Straight Answer, proceeded to erase 40 rolls of film of the Apollo Program -- the flight to the Moon, the flight around the Moon, the landings on the Moon, the walking of guys here and there. They erased, for Christ’s sake, 40 rolls of film of those events. Now we’re talking about several thousand individual frames that were taken that the so-called authorities determined that you did not have a right to see. Oh, they were disruptive, socially unacceptable, politically unacceptable. I’ve become furious. I’m a retired Command Sergeant Major. I was never famous for having a lot of patience. The idea, when I found out, that they had erased 40 rolls of film involving of several thousand individual shots about what really happened up there, I became so furious that, you know, I could have punched the director of NASA in the nose. I’m not the easiest man. I like to tell people that, like Henry Higgins in My Fair Lady, I have the milk of human kindness by the quart in every vein, so I really am a gentle man. But I have the capability, the potential of being rather dangerous and violent. And these lies and these cover-ups that I have learned about firsthand over the years literally infuriate me. And I hope it infuriates you, because these authorities, these nit-wits in high positions of power who are proceeding to spend all the money the American people make for their own use, their own private programs, and then lie through their teeth about what the truth really is. Well, thanks to the idea that there were a few employees in NASA 40 years ago – even today there are some good people working there, decent people, honest people – I have some film that they preserved, that was not destroyed. This is a NASA photo. This is Apollo 12, Apollo Systems 12, roll number 50, negative number 7348. They were flying over the Moon before they landed. They went into orbit around the moon, as many of you know. I’m sure this is no secret. They went into orbit around the Moon and, while they were there in orbit around the Moon, a number of anomalous artifacts began showing up showing interest in them. Next picture, please. Ah, this picture was taken by Neil Armstrong. While looking out of their window of their little craft, this object flew by. There is the moon in the background, of course, below the object that flew by the window of that little craft that they were riding in. Neil took the Hasselblad camera that he had, put it up to the window and snapped this picture. Next picture, please. Ah, NASA Apollo 12, roll 51, negative 8653, something like that. Now this is a good-sized object. This is several hundred feet in diameter that came up next to the Lander and flew along beside them for a time. The guys in the Apollo craft put their camera to the window and snapped the thing, and I’ve always jokingly said there were guys inside of this, taking pictures of the NASA craft. We were photographing them; they were photographing us. Next picture, please. 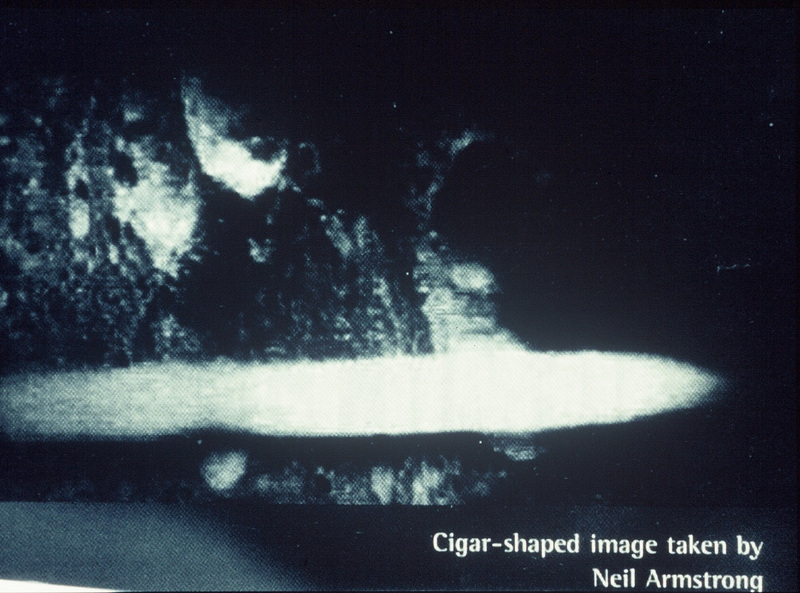 Photo NASA Apollo Systems number 14 – Apollo 14 – roll 70, negative, what is it -- 9837 or 9887? This is the Lansberg crater on the moon. The guys in orbit above the Moon were particularly fascinated by Lansberg. 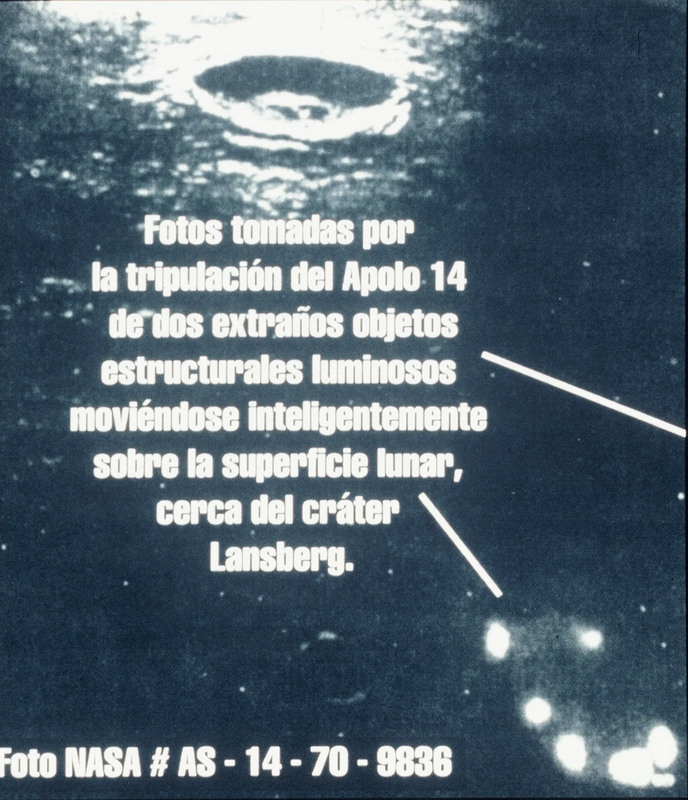 They had been given a special assignment to take pictures of Lansberg, because the crater, which they designated as the Lansberg, had things going on in the crater that were very anomalous. There was construction going on. There were enormous facilities in the crater up there. So they were specifically designated and assigned to photograph Lansberg to see if they could figure out what the hell was going on down there in the crater on Lansberg. While they were looking at Lansberg, this object happened to express interest in them and flew by. Now this line is an artificial line that was drawn to show you the … it gave the direction that this object was going. This is a good-size object flying past the Apollo Lander. God, I’m so glad that some of these were saved. I still get angry, 40 rolls of film, for Christ’s sake, and they erased them. Anyhow, next picture, please. 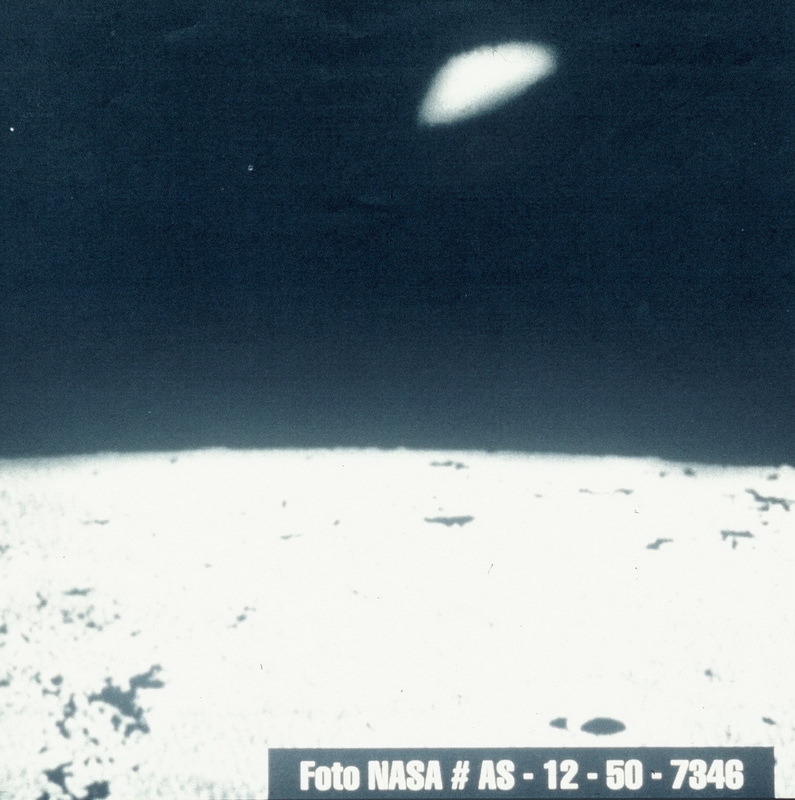 This is the same photo of Lansberg, but the next negative, 9838 of this object here flying by. Next picture. Ah, now we’re getting into some nitty-gritty. I want to give you just a brief little bit of history here. 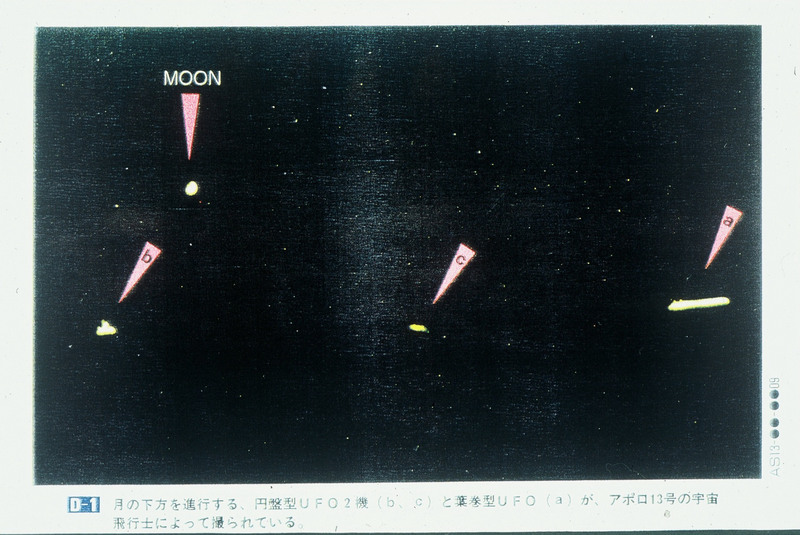 Back in the early days of NASA and the Apollo programs, I got this picture from the Japanese space agency, the Japanese NASA. They have a tremendous program going over there in Japan. You know the Japanese are bright people. The Japanese space agency signed a contract with NASA years and years ago, to buy copies of every picture NASA took during the Apollo Program. And I’m sure the Japanese people paid a sizeable amount of money for this contract. And as the films were developed and the photos were made, they shipped them off to Japan and the Japanese had a tremendous reservoir of goods of regional NASA pictures. They bought them. They paid for them. 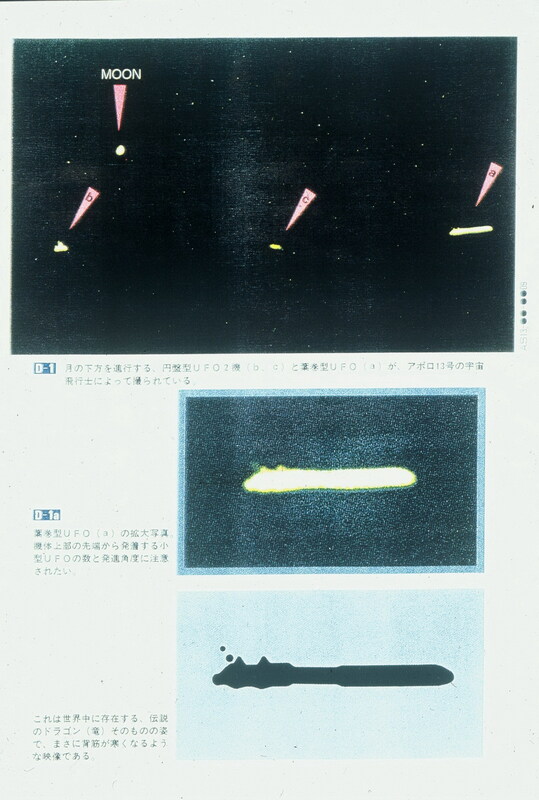 So this photograph was released by the Japanese space agency; you can see the Japanese writing here. 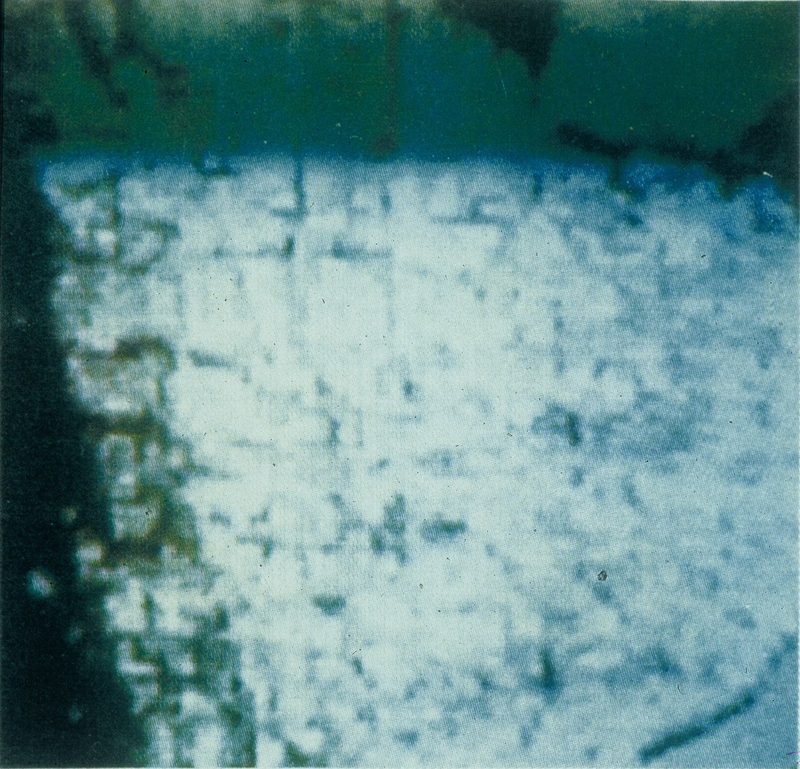 This was taken by Apollo 13. Now, you’re all familiar, I’m sure, with Apollo 13. 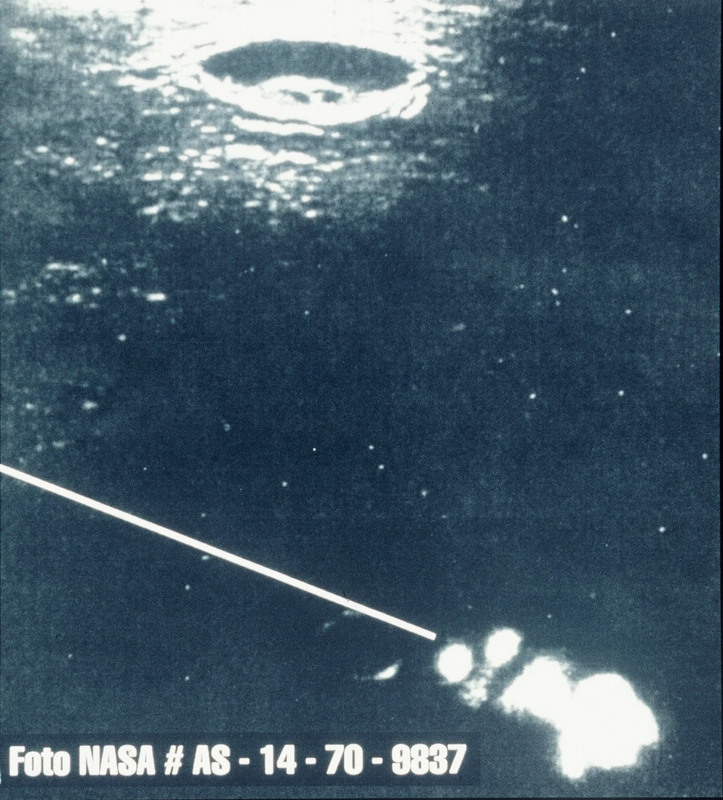 That was the aborted mission that was going to the moon to land and they had an accident on the way. They couldn’t land. They damned well barely got back. While they were on the way to the moon – here’s the moon – a number of things began happening. 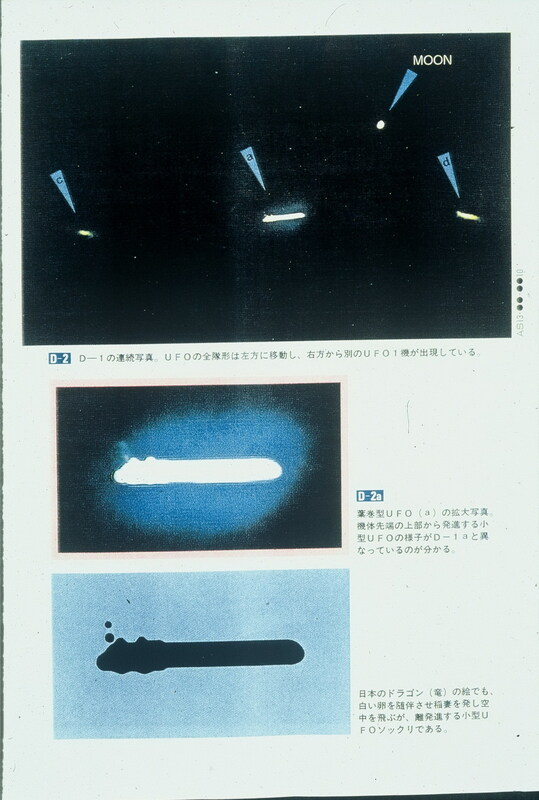 Some strange objects were appearing outside the windows of the spacecraft so the guys grabbed their Hasselblad cameras and start taking pictures. This photograph shows three different objects. This looks like a circular object with an enlarged dome on top. 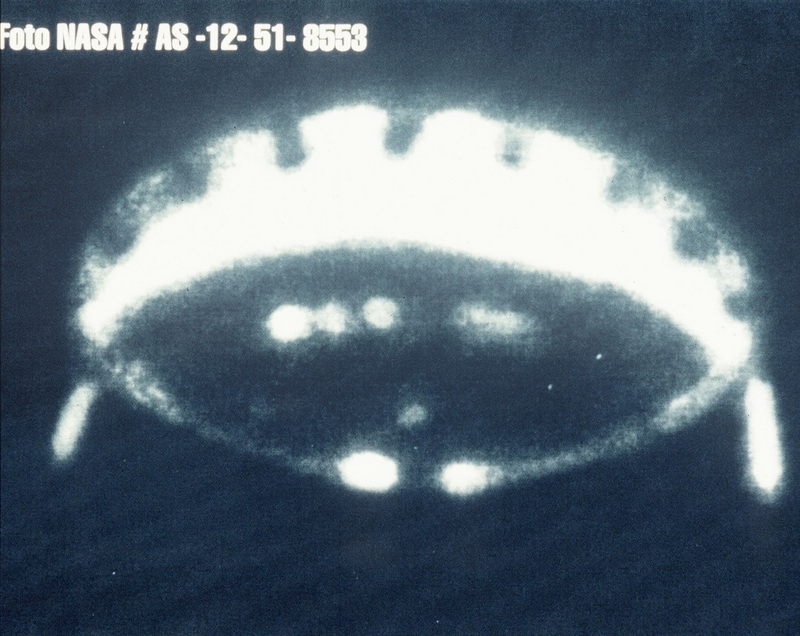 This is a smaller object with a circular kind of disc-shaped craft, but coming in from the right margin of this picture is this. Next picture, please. Here we are. This is a blowup of the positive in the photograph and here is a blowup of the negative of this object here. Ladies and gentlemen, this particular object is five miles long. I’m tempted to use the term big mother. No pun intended because it appears to be a mother ship. It’s gigantic, five miles long and here are these NASA guys are up there in this little cramped Apollo capsule, and they look out their window and they see something that is five miles long. It shakes them up a little bit. 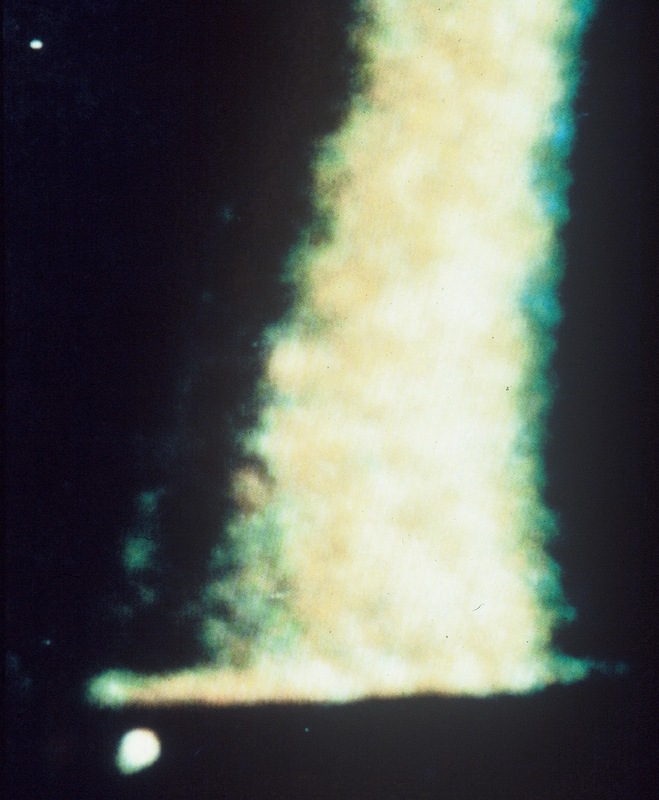 And when it got back to NASA, these pictures shook them up a hell of a lot. Next picture, please. Ah, this is the next sequence. Here this large mother has moved into the middle of the frame and something else has come up over here, which has been estimated to be two miles long. But this really upset the guys. I have never been able to find out which one of the three Apollo members of the Apollo 13 group would admit to ever having taken these pictures. So, as you know, the Apollo astronauts were threatened with their lives, I kid you not. They were threatened seriously. They even threatened their families if they ever divulged any of the information that they knew. Next photo, please. Here we are. Here’s the big mother; here’s the other one two miles long. Here’s a picture of the positive; this is the negative. This mother is five miles long. Up here you can see what appear to be two circular objects, either arriving or departing from that particular big ship. I can almost understand why the authorities in NASA, why the authorities in the space program didn’t want this information to come out. They were frightened; they were stumped; they couldn’t deal with it themselves and they figured, if they couldn’t handle it, you couldn’t handle it. There would be social disruption; I believe is one of the terms they used. They would disturb the body politic; I believe the term they used. So they clamped the lid down on this and it is still down and it is going to stay down, I’m afraid, for some time yet, until people like yourselves and me and the rest of the people here on this stage, by pushing and prodding and chipping away at this lie and the secrecy, until, eventually, we will succeed. And, don’t you doubt that for a minute. Ah, now I’m in for another photograph which I think will shock you some. In 1980, NASA -- Never A Straight Answer -- launched the Voyager program to Saturn. They launched this little mechanical space ship filled with cameras, film and so on. They wanted to go to Saturn because something had been going on in the rings of Saturn, around the moons of Saturn that didn’t make a lot of sense. Some anomalous events were taking place in Saturn, near Saturn, at Saturn. So they launched the Voyager in 1980. The pictures they got back from Voyager was so stunning and so shocking that they just locked them up in a safe. Fortunately I met and developed a friendship with a retired NASA scientist by the name of Norman Bergrun. I think he couldn’t publish in the United States; no American publisher would even touch it. Norman Bergrun had to go to Scotland, for God’s sake, to Aberdeen, to get his book published. And he published it. He did succeed. He got his book. 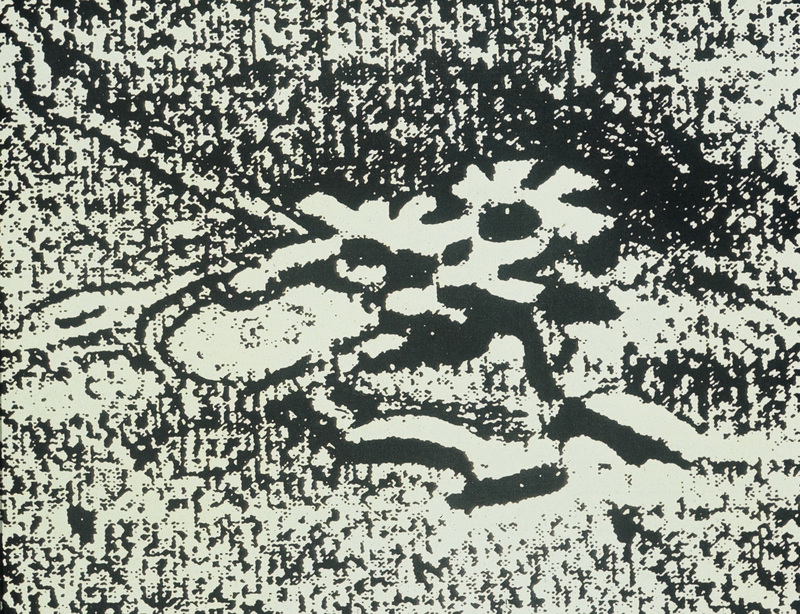 It’s a piece of genius; it’s a beautiful piece of work, and the things that they photographed near Saturn appeared in print for the first time. This is the A-ring of Saturn. I think you’re all familiar with what Saturn looks like; it’s a beautiful planet. It’s a giant, but it’s got rings all around it. Well this is the A-ring and here’s the object that is self-luminous, obviously artificial, larger than our moon, that seems to be moving all around throughout the rings of Saturn and among the moons of Saturn; and Saturn’s got a couple dozen moons. This object here, as I said, larger than our moon, moving all around apparently under intelligent control in the rings of Saturn. Now, try for a moment, if you can, to imagine the kind of a technology that is capable of constructing something larger than our moon, that’s artificial, that moves around wherever it wishes to go that has probably got several thousand guys inside. That is shocking to some people. Next picture , please. Ah, this is the pièce de résistance, I guess, as the French say. Here you have another self-luminous, artificially constructed object, circular in shape, larger than our moon that is also moving here, there and everywhere throughout the rings of Saturn and among the moons of Saturn. You know, there has to be intelligence aboard. But this is the one that really blew the NASA people on the Voyager program out of the water. This object – this is an object guys – is 2000 miles long. It’s 400 miles in diameter, and it is an artificially constructed… Norman calls them an electromagnetic vehicle. He says they appear to be making the rings. This is one of the rings of Saturn; I think this is B-ring. Bergrun says he thought they were probably making the rings. I said: Norman, you have to consider the possibility they may be mining the rings. I think the rings are probably rich in nutrients, in minerals probably, and an incredibly advanced civilization I think would work out some system of mining those rings for all the minerals up there and utilizing them because space is filled with wealth; energies of all kinds. They never have to dig another hole in the ground like we do down here. Space is filled with energy. This is 2000 miles long and here on this end, there seems to be something like an exhaust or a flare of energy of some kind. It’s probably the result of engines of some type inside this thing; but, whatever it’s doing, it’s there, and it’s a recognition and representation of an advanced intelligence. And that’s one of the things that they don’t want you to know -- that we are confronting and relating with an intelligence that’s so far beyond our own; we’re looking at and talking about what’s known as a Type II civilization. Now, for your own interest -- I suspect most of you suspect this -- but you are all members of a zero-zero-type civilization. Beyond us, hopefully in a century or two, we might become a Type I. But this is a representation of the Type II civilization. Michio Kaku, the famous Japanese-American physicist in New York, has put out this concept about Type II, 0, I, II, III and IV of the kind of advanced cultures and civilizations we will probably meet out there. Well, we’ll probably meet out there; we have already met them. They’re here; they’re in our midst. So, I brought about 15 or 20 of these pictures but I simply have no time; I don’t have the time to show them all. So I’ve shown a few here and I think I’ve piqued your curiosity. And, I think most of you are pretty bright people and you know you’ve been conned. You know you have been lied to. You’re not fools and I think you know who you are and why you’re here and where you’re going. Ah, this is a photograph taken by our Mariner space vehicle that we launched back a number of years ago. This is a picture of a facility on the surface of Mars. Now, this facility is located on the equator, and it’s on the surface, and those of us who have studied it and discussed it with each other, call it the airport. I said this is the parking lot (oval flat area). This is the administration building here (raised semi-circular area adjacent to the left of the oval); this is the main terminal here (structure directly behind the oval flat area), and I imagine it is a pretty busy facility, you know, with ships coming and going, but it’s not an airport. It is very likely a spaceport. It is on the surface and it’s on the equator of Mars. And if you are ever interested in launching a vehicle from a planet, you put it on the equator and you take advantage of the rotation of the planet to assist in the launching of your vehicle. You can take the momentum of the movement of the planet and it helps you get the thing off the ground. So, it’s exactly on the equator; it’s on the surface and it’s massive in size. So maybe that is the parking lot; I don’t know. Maybe that is the admin building, but there is something going on, on Mars, and I’ve been going back and forth with Richard Hoagland now for years, where Richard, who I know most of you are aware of, is convinced that Mars is covered with ruins. Well it is. But it is not just ruins. There are things going on, on that planet; on the surface, under the surface, continually so. Next picture, please. Ah, this was published in a German magazine but this is a Soviet photo. This is from their Phobos 2 spacecraft. This is a city under the surface of Mars that is the size of Chicago. Chicago is one of our biggest cities. Several million people live in Chicago. This is under the surface. You can see the city block … breakdown here portions of the neighborhoods here or whatever it is, but it is generating an enormous amount of heat. 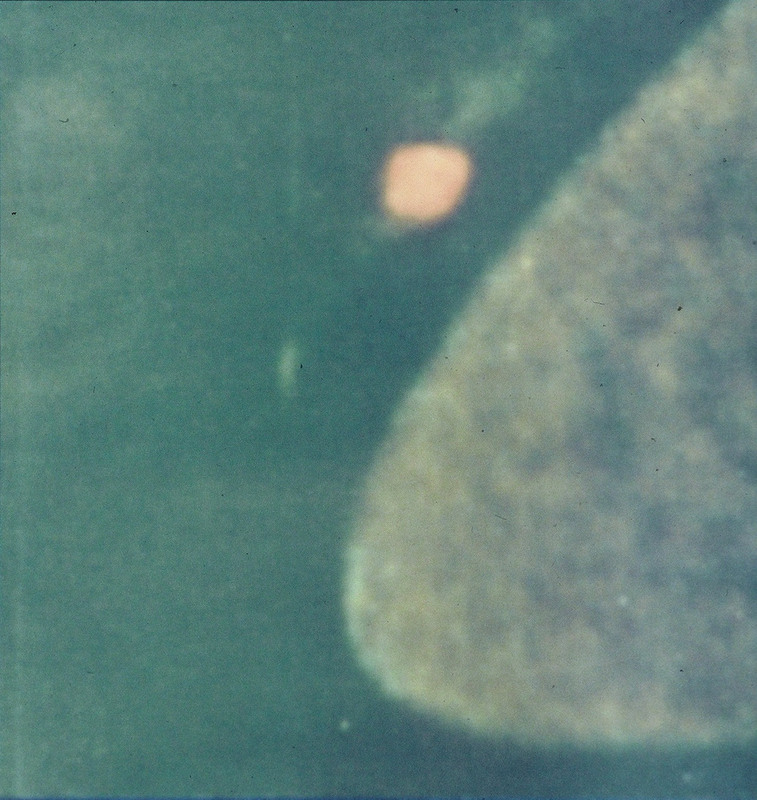 And they picked this up on the infrared when Phobos was going around the planet snapping pictures like crazy. The Soviets were pretty open about releasing some of their photos, contrary to the United States, where lying has become a fine art. Don’t get me started on my politicians. Phobos 2, the city on Mars, under the surface; you can see the streets, Broadway, First Avenue, whatever. People have said, well, who’s there? And I says: For God sake, it’s the Martians who are there! What a silly question to ask: Who’s there? Now, I love this picture - Earth. I love this lady. Your ancestors and mine called her Gaia. She was feminine. She was a goddess. She was sacred. This beautiful lady has a respiratory system, she has a circulatory system and she has a heart. She is our source of life on this planet. We needed her. We need her now. We wouldn’t be here if it were not for her. We talk about holy lands: Mecca, Jerusalem, here, there, everywhere. That is the holy land, people -- that beloved planet that we are on. Next picture, please. I spoke to you earlier about the fact that your grandchildren, great-grandchildren and so on -- the generations yet to come -- have their destiny in the stars. And meantime, they will go out there and claim their rightful place in that infinite community of life. You can believe that and you can accept that with an assuredness and truth that goes beyond doubt. The destiny of this species and this race, this troublesome clan of monkeys, is in the stars and there is your destiny. I want you to understand that and have some hope, and don’t get depressed, because you are going to be undergoing some very difficult times in a few years left ahead. We are going through this transition, this transformation, this transcendent transformation into another species, into another race. And, if you remember your own adolescence, it was a painful time. The species, the race, is going through adolescence, but we’re not alone. We’re getting helpers. We have family out there that’s helping us and they’ve been helping us for a long time. They’ve been trying to encourage us and nourish us and trying to point the right direction for us to go, because we are a troublesome adolescent children, and we are going through that transformation. But my point is that there is no doubt about the inevitable destiny and truth of the human race. Now, I want to quote something for you if you’ll bear with me here. One of my favorite authors, poets, was a man I’ve admired for years: Count Leo Tolstoy. Tolstoy said that there is something in the human spirit that will survive and will prevail. That will survive and prevail and there is a tiny brilliant light burning brightly in the heart of man that will not go out no matter how dark the world becomes. And in the years ahead when things are difficult and economic problems take place, there will still be disruptions, fear, hope; sadly enough, I’m afraid, there will still be blood in the streets, here, there, and everywhere. This coming out of adolescence is not an easy process. But then what do you do when you leap beyond adolescence? You reach adulthood. You grow up. And we’re growing up. Now, ladies and gentlemen, my journey is coming to an end, but for many of you out there your journey has just begun. And I want to show something to you before I leave the stage this afternoon. No matter how dark the world becomes, you can be sure, as Tolstoy said, there is a spark, there is a flame burning in your heart that will never go out no matter how dark the world becomes. Kerry Cassidy (KC): Everyone, I’m Kerry Cassidy, from Project Camelot. Henry has something he wants to say to Bob. Bob? This is Henry Deacon and we just want to say something here. This is Henry Deacon from Project Camelot for those of you who are familiar with our website. He’s here today, and he’s here at the conference. He has something he’d like to say, Bob, about Mars. Henry Deacon (HD): I don’t have any words, but Bob has expressed everything that I would have said and I can confirm, because I’ve been working in Top Secret for 30 years at above Top Secret. We share a common background, but I just met him recently here and I can only say that: Yes, there’s life on Mars. There are bases on Mars. I’ve been there. BD: I didn’t even get started in telling you some of the things that I wanted to share this afternoon about who and what is on the moon, and Mars that Henry knows. HD: It’s a long story, as he said. There is not time to put it all together. Except that it’s a positive story, it’s not one of fear. He showed a picture of Mother Earth and it’s giving birth and there are birth pangs, but there is a child that is being born. And just forget about the fear, because that’s just really a temporary thing. HD: So a friend of mine, Angelica, who no one knows, she calls this the emerald planet and it’s alive. Yes, it’s very much alive. We’re a part of that lithe life form and life spreads throughout this whole galaxy and the rest of our family is watching and waiting, and helping quietly behind the scenes. And I’ve been fortunate enough to be able to meet family that don’t just live here on terra for a long, long time even before I was in government work, so thank you. BD: Ladies and gentlemen … am I still broadcasting here? This is for Hoagland. [laughter] I attended my son’s retirement ceremony in Washington D.C. in November. My boy retired in November in Washington as a Full Captain in the United States Navy after 30 years of service. And while I was at this retirement party, the room was filled with Admirals and Generals and retired Commanders and Captains and so on. And we all had something cool in our hands and we were all moving around each other amiably and relaxed, you know. A retired navy scientist, whose name must remain untold, came up to me, nudged me and said: I know you. And I said: Yes, I’m Eric’s father. No, no, no., he said: I know you. You’re that notorious retired Command Sergeant Major with the big mouth. And I said: Yes, I’ll go with that. He said: I have to share something with you before the party is over. He said: I retired several years ago. My last job was at a government laboratory in Nevada a few miles from Las Vegas. I'm a plasma fusion physicist; that’s my expertise. That’s my training, my background, my occupation. Not being a scientist, I go: What? What? A plasma fusion physicist? He said: Yeah. I worked at this laboratory outside of Las Vegas. It’s not commonly known; it’s fairly secret. I worked five years with two guys who are not from here. They were from somewhere else. They were delightful people. They were scientists; they were working with us. They were assisting us. They were encouraging us and offering us ideas and possibilities and one thing and another in plasma fusion, which is infinite energy forever. And the scientist said: I had to agree with him. We are. We are a primitive, savage and dangerous race at the moment. And the scientist said: My first thought was, you know, I didn’t spray under my arms this morning, maybe. And they tried to explain that we humans have a psychic odor about us that they pick up and they find it terribly offensive. So it hit me between the eyes because, when I was a boy growing up, my grandmother used to say: If we could only see ourselves as others see us. It would help so much to develop our integrity and our character and all that, and this remark of my grandmother hit me that we were getting this so-called from the horse’s mouth from one of our extended family out there that: you’re primitive, savage and dangerous, but you also stink. I thought that was humorous and I shared that with Gogo and she said: Please include that in your presentation. So Gogo, bless your heart. I did that for you, you know. HD: One sentence. It relates directly to what Bob has said. If you want contact, raise your spirit high. That’s what they want because they don’t want to mix with you if you’re savage beasts. It’s that simple. Just relax and be happy and work with each other. It’s a very simple message. KC: If you want to learn more about Henry Deacon, he's on our site. We have a lot of very long transcripts all about who he is, some of where he worked, and about Mars. We also have a video called Jumproom to Mars, in which David Wilcock, Bill Ryan and I discuss some of what he told us. We’re looking for, maybe a fifteen-minute, maybe half-hour tomorrow when Henry Deacon can address you and maybe tell you some of the details. Thank you. BD: Let me add one more sentence. [laughter] I must add this. I have traveled all over the planet and I have spoken to conferences all over the world and all over the United States. I have never been to a conference of this nature without there being at least one, and generally two, of the others in the audience. I want you all to think about that and look around you and know that in your midst... [laughter] you have good friends in high places, and they’re in your midst, and I’ve learned over the years to recognize them. BD: Exactly, they’re family. But like Ingo Swann, I’ve developed the intuitive ability to spot them and recognize them and now I have them coming up to me at conferences, introducing themselves to me. There are no limits. Life is infinite and forever. God bless all of you, and I will tell you goodbye this time.